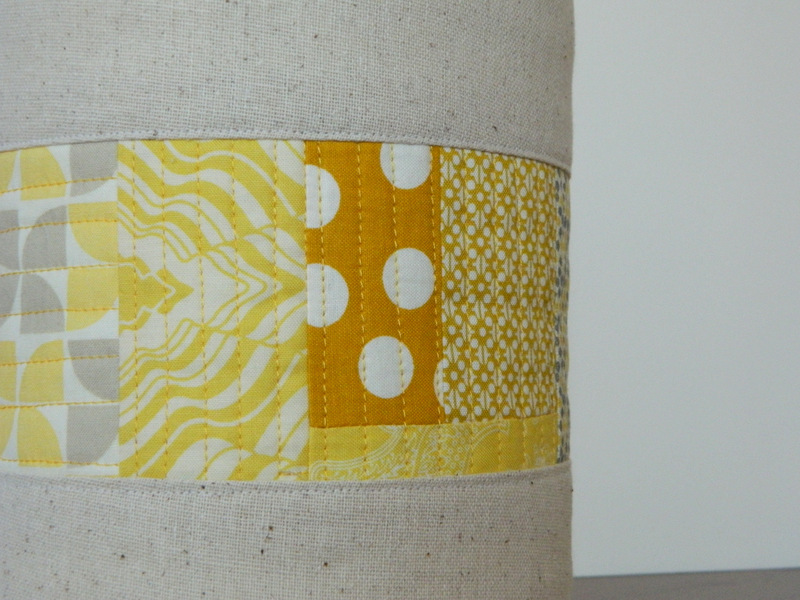 This weekend I worked on organizing my fabric scraps. I hadn't bothered before because I didn't have that many. I used to put them in a large glass canister. 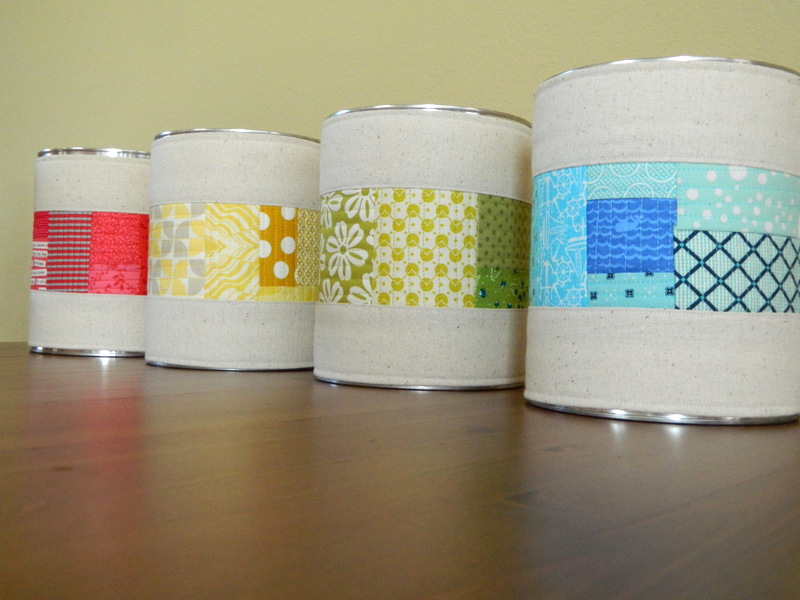 But lately the canister was overflowing, so I decided to start dividing them by color. 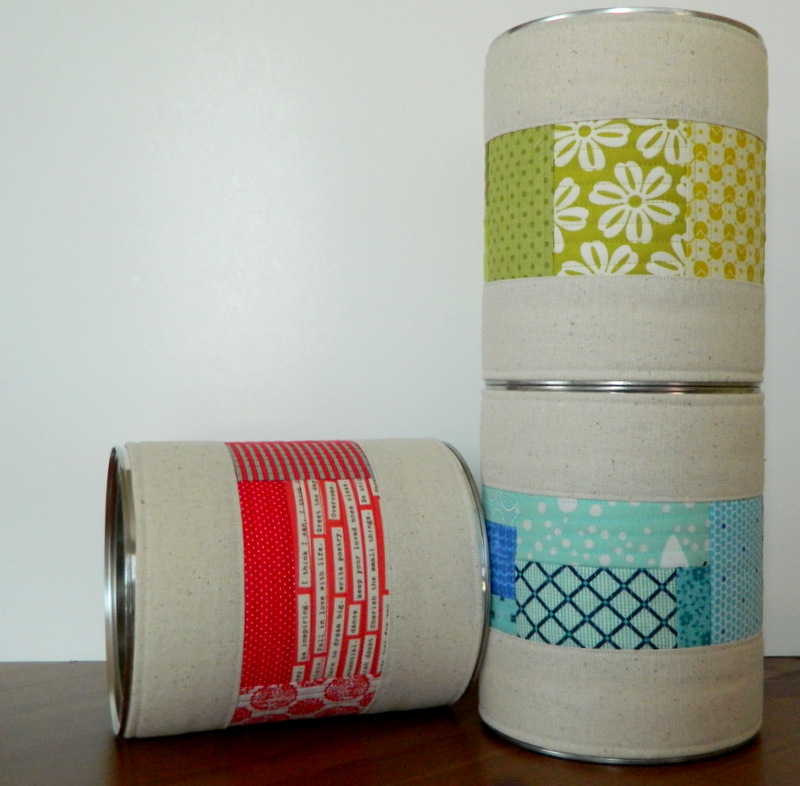 Last week I brought home from work a few empty large coffee cans and covered them with fabric. On the middle of the panel I used fabric scraps to represent the color fabrics I'm going to store inside and used the Quilt As You Go technique to attach the fabric pieces. Hello fellow Blog Hoppers and welcome to my Weekend Doings. I have been looking forward to this day for a few months and it is finally here! My name is Martha. I live in California with my husband and our two beloved dogs. I am an accountant and currently work full time as a business administrator for a construction company On my free time (on the weekends) I enjoy cooking, baking, gardening, taking photos, and my new found love: quilting. I'm so glad you are here, please look around and I hope you visit again. How long you have been quilting? Not long. My husband bought me my first sewing machine on January of this year. I was looking for a new hobby to keep my mind occupied to help me overcome the loss of my mother (she passed away last year just two months after been diagnosed with breast cancer). So I decided to venture into sewing which then led to quilting. I learned to embroider and hand stitch from my mom. She was a very talented tailor. Growing up I spent many afternoons sitting by her side looking at her do wonders with fabric, playing with the scraps and rearranging the pins on her pincushion. But I never asked her to teach me how to sew; I guess I figured I had time, and I now regret it... I think it would had been wonderful if we had discovered quilting together. I still have a lot of things to learn, but in my short experience sewing I have learned that is important not to stress out if a project doesn't turn out "perfect" the fact that it is handmade is what makes it perfect and more precious. Be yourself and enjoy the process. Oh there are so many... Linen is a must have and right now on my wish list are Aneela Hoey's So Stitchy, Denyse Schmidt and Liberty of London Fabrics. My rotary cutter. It just makes cutting fabric so easy! Favorite TV show while hand stitching? Re-runs of Gilmore Girls and Friends. The Big Bang Theory and the Mentalist. Binding - by hand or by machine? Both, I first attach the binding to the front of the quilt by machine and finish it off by hand. If I'd had known - what you wish you knew before you started your blog? If I had known how embracing the blogging community would be I would had started my blog a lot sooner. I'm amazed everyday at how friendly and talented everyone is. I finished my Dresden Mini Quilt today. It is a tiny one... it only measures 10X10 inches. But I have never done a Dresden before, so I wanted to start small. The Dresden is hand applique to the background fabric and I used Perle cotton thread for the hand quilting. I really like the way it turned out. It makes me think of a sunny summer day every time I look at it. I am going to hang it in my sewing room to add some cheer to my wall. Some of the things I started to work on this weekend: a dresden mini-quilt and a scarf. I had not done any knitting for a while and last Friday I visited my local Jo-Ann store and I couldn't resit this yarn. It feels so soft and cozy I immediately thought it will make a great scarf to keep me warm this winter. I just hope I can finish it in time! August sewing was great. Though, I didn't accomplished a massive amount of projects (as I had wished for) I'm very happy. I managed to finish the Alphabet Quilt for my goddaughter just in time for her birthday. 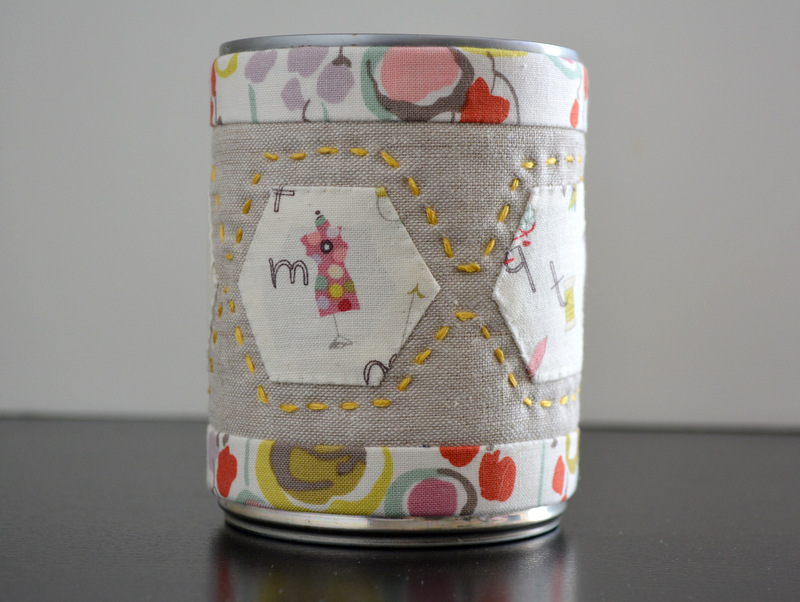 Then, after much planning I finally moved my sewing room to a sunnier location in the house, covered some tin cans with fabric to use as storage and tried English paper piecing for the first time. I hosted my first giveaway and started a new quilt, which I hope to finish very soon. I'm looking forward to September and hope to get a lot of sewing done. I'm very excited to be hosting my first giveaway! 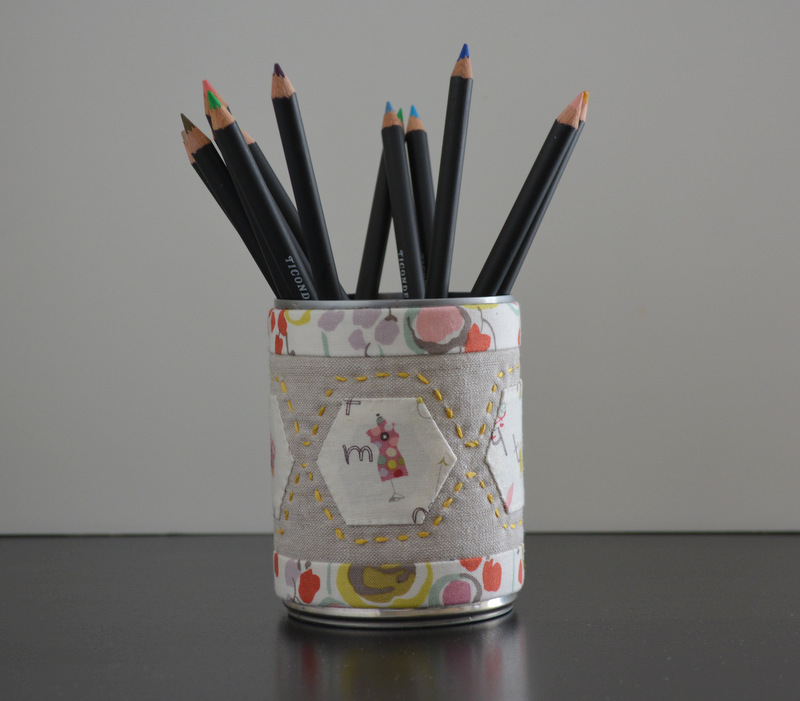 The giveaway is this little pin cushion I made specially for this occasion. The word "Pins" is hand embroider (by me). If you are a follower of my blog (existing or new) you have a second change to enter, just leave a comment that says "following"
The giveaway will be open through Thursday August 30, 2012 until 9:00 pm PST. Then a winner will be chosen at random and announced on Friday August 31. Please make sure you leave an e-mail address where I can reach you. I will be happy to ship internationally, so anyone can participate.